Say hello to a bowl of caramelized fennel corn chowder. It was noon thirty on Sunday and I was hungry. But it was raining, I was pretty full from breakfast, and what I really needed to focus on was cleaning the house. Never a good sign when your feet turn dusty gray from walking around barefoot. So I did what I always do when I want something healthy, light, and quick to eat. I made soup. But I’m not talking pour-it-from-a-can, chunky chicken and wimpy noodle soup. I’m talking about a delicate, earthy soup that is complex in flavor and simple in construction. 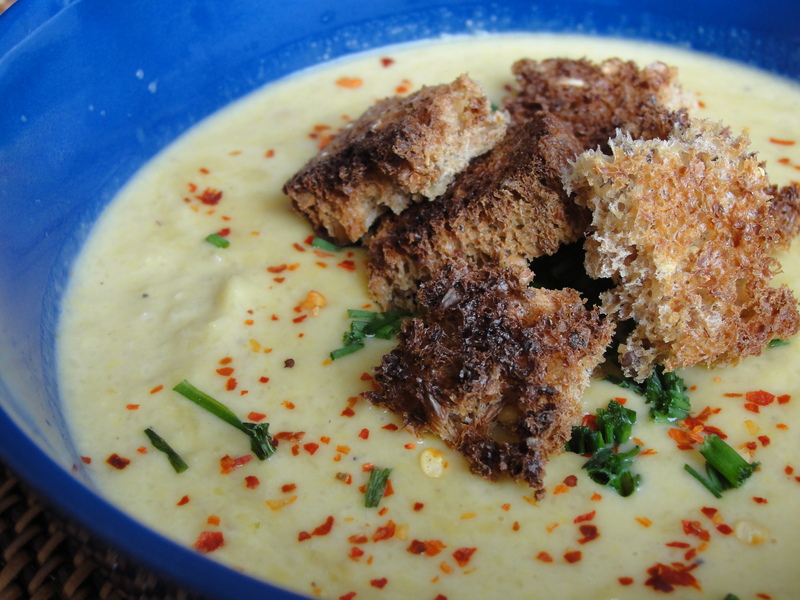 I’m talking about caramelized fennel corn chowder soup. And nutrition standards only allow 480 mg sodium (the equivalent of more than 1 gram of salt) per serving. Let’s be honest, who’s only eating half a cup of soup? So if you are now becoming concerned with all those question marks you are consuming, let me propose an easy solution: let’s make soup at home. As I have said before, what I think holds people back from cooking is not necessarily money, but a sense of comfort in the kitchen. And for the busy, on-a-budget, nervous cook, soup is a great way to get your feet wet and learn how to make healthy, low sodium meals at home. 1) You can use pretty much any vegetables you have lying around – frozen peas and corn are hearty and nutritious, leftovers always work well, even leafy greens in a light broth can be comforting – which enables you to avoid grocery store wastefulness and make low sodium meals without spending much money. 2) With the right tools – I think you all know by now that I’m talking about an immersion blender – you can whip up fresh soup in a matter of minutes without making a mess. It can be a one-pot clean up. Roast or caramelize your vegetables first – this will bring out the natural smoky and sweet notes of your tomatoes, cauliflower, onions, corn, fennel….well you get the point. Top it off with fresh herbs. Not only does it perk up your taste buds, it can turn a bowl of slop into something that looks refined. Add a dollop of heavy cream or crème fraiche to lighten the taste. The cream may mute the color, but the taste will become richer. Gentle citrus notes, like a squeeze of orange, can add a surprising brightness to soup and work well with root vegetables and squash. A pinch of spice never hurts. Stir in some curry powder (great with pea soup and cauliflower) or sprinkle some red chili pepper flakes before serving. If someone wasn’t paying attention before, they will be now. I created this particular caramelized fennel corn chowder recipe on the fly after assessing the ingredients I already had in my possession. It took me less than 30 minutes to make and consisted of only 5 products: fennel, roasted garlic, frozen corn, heavy cream, and low sodium bread. So take a spin with some homemade soup this week, the weather is perfect for it. If you need suggestions for good veggie combinations, my friend who currently resides in London Town loves this NY Times roundup. 1. Spoiler alert: this recipe was so quick because I already had roasted the garlic for a dinner party the night before. To roast the garlic, cut off the tops of the entire head of garlic and put into a little boat made of tinfoil. Drizzle a teaspoon of olive oil onto the garlic and throw it into an oven on 375 degrees for 40 minutes or until the garlic is soft. If you are in a rush though, skip the roasted garlic and simply sauté in some olive oil in your soup pot on medium heat. 2. Heat the tablespoon of olive oil in your soup pot over medium heat. When hot, add the fennel (and garlic if you are not roasting it). Stir constantly and allow the fennel to soften and turn to a nice, brown caramel color. Should take 5 minutes. 3. Add the corn and allow it to soften for another 5 minutes. 4. Add the roasted garlic (if you made roasted garlic) and the cup of water. Allow to simmer for 15-20 minutes to draw out the flavors. 5. Take pot off of the flame and plug in your immersion blender. Blend on low to medium for 2 minutes or until the consistency is nice and creamy. You can always add an extra step of running the soup through a sieve if you want it to be absolutely silky. 6. Put pot back on the burner and turn flame to low to reheat. 5 minutes before serving/eating, add the cream and stir. 7. Ladle steaming soup into a gigantic bowl or cup and top with fresh herbs, croûtons, and pepper flakes if desired.